The traditionally described characteristic appearances of colorectal Carcinoma (ulceration and neoplasic stenosis) actually correspond to advanced lesions. In 1962, Potet et al. had the insight to suggest a hypothetical relationship between malignant adenomas and ulcerative Carcinoma. This hypothesis is now accepted by most authors [3, 7]. Macroscopically, the change from malignant polyp to vegetative infiltrating and ulcerative Carcinoma is perfectly conceivable and can be explained by the necrosis frequently associated with malignant tumors (Fig. 4.1). This evolution has been confirmed numerous times by studies of polyps which have developed into common Carcinoma [2–9]. 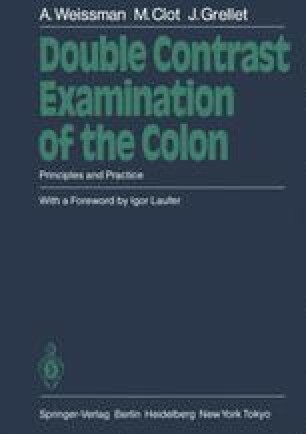 Consequently, the study of radiologic appearances of colorectal cancer has three parts: (1) nonspecific radiologic images of sessile or pedunculated lesions where only a histologic study will diagnose their benign or malignant nature: (2) radiologic signs indicating the malignant nature of a polyp; and (3) the radiologic appearance of more advanced cancers.